October 18-20 in St. Paul, Minnesota will mark the fourth-annual Conference on Language Immersion Education. An offshoot of the Center for Advanced Research on Language Acquisition (CARLA) at the University of Minnesota, this conference brings together academics, professionals, students, and experts from around the world in discussion and open exchange of research-based ideas on immersive teaching. This year’s topics will include pedagogy and assessment, program design, effective leadership, policy and advocacy, and the cultural and community aspects of foreign language education. Embracing different models of language immersion, the aim of the conference is to foster information exchange that will lead to developments in literacy and cultural development. 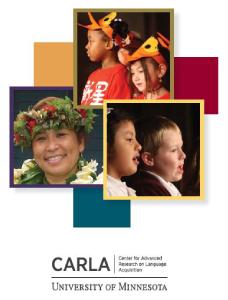 CARLA, the organization that coordinates the Conference on Language Immersion Education, is a Title VI National Language Resource Center under the U.S. Department of Education. This designation implies government funding under the auspices of bolstering the nation’s teaching and learning of foreign languages – an endeavor particularly critical in an ever-globalizing world and in light of a decade of educational budged cuts. Since 1993, CARLA’s undertakings have included the Technology Project, offering symposia for language teachers on the use of new technologies in the classroom; the Less Commonly Taught Languages Project, offering a summer seminar on materials development for teachers; the Language Assessment Project, consisting of a battery of examinations to better assess student speaking and writing proficiency; the Language Immersion Education Project, providing resources for teachers utilizing immersive models of foreign language education; and the Languages Across the Curriculum Project, whose aim is to encourage cross-disciplinary foreign language education. CARLA has also offered pragmatics and articulation courses for foreign language educators. The University of Minnesota’s CARLA is one of fifteen Language Resource Centers currently funded by the U.S. Department of Education. Institutions across the nation – from the University of Hawaii to the University of Wisconsin-Madison, from California to Washington, D.C. – share the aim of fostering foreign language education through new technologies, robust teacher resources, and the free and open exchange of ideas.